The Eppendorf Pipette Starter packages were designed to give you the ability to accurately pipette any volume from 0.5 μL to 50 mL between any type of vessel (tubes, plates, bottles, etc.) with Research Plus Pipettes, a Motorized Controller, and a Repeater. The package includes 4 air cushion pipettes for accurately pipetting volume ranges from 0.5 μL to 1 mL. Also included is the Easypet 3 to simplify applications requiring large pipetting volumes from 1 to 50 mL with serological pipettes. The included Repeater M4 speeds up dispensing series with up to 100 dispenses from a single aspiration. Complete your package and add epT.I.P.S. to your order. Eppendorf pipette tips are designed to fit Eppendorf pipettes perfectly, ensuring a tight seal, improved accuracy and reproducibility, and better data. Savings compared to purchase of individual items at list price. 2 Delivery package includes Repeater M4 and Easypet 3. Purchase of a Liquid Handling Starter package qualifies for the redemption of a FREE Pipette Carousel 2 and a Pipette Holder 2 for the Repeater M4. The 2–20 μL pipette included has the yellow operating button. 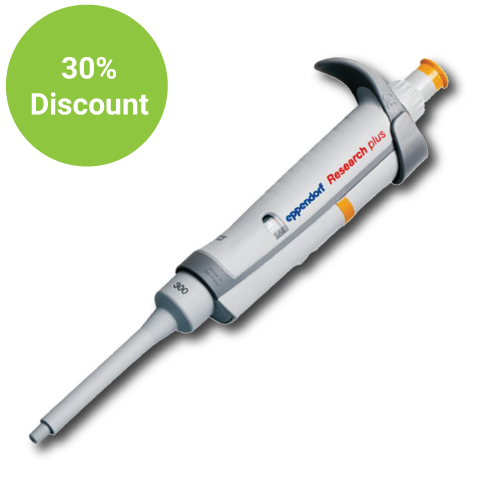 The Eppendorf Research Plus Pipette reduces the risk of repetitive strain injury (RSI) with spring loaded tip cones. This pipette is designed to alleviate stress on the user’s hand when mounting a tip on the pipette. The Eppendorf Research Plus absorbs the pressure applied by the user when mounting a tip on the pipette. Therefore, you never have to jam the pipette onto the tip again. The Eppendorf Repeater M4 can accurately and precisely dispense any liquid, including viscous, dense, and volatile liquids. 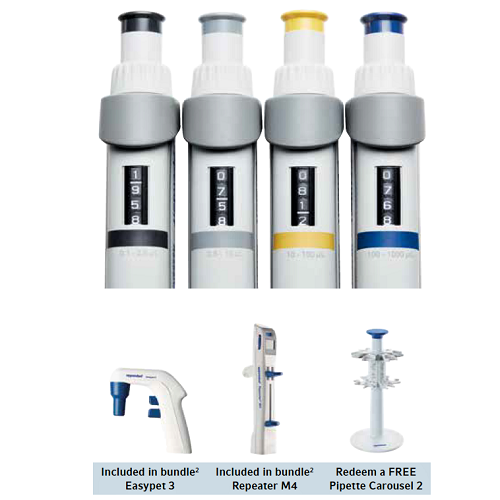 The Eppendorf M4 repeater features a volume range of 1 µl-10 mL (max draw 50 mL), it is unique in its ability to dispense and aspirate liquid up to 100 times without refilling the pipette tip. Ideal for those working with oils, alcohols and 96 well plates. The Eppendorf Easypet 3 Motorized Controller technology allows for complete speed control when pipetting upto 100mL of liquid.